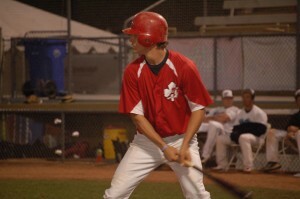 Beau Brett stands in the batter's box for the Canada A's in the team's 15-13 win over the Palm Springs Chill on Feb. 15, 2011. Brett has a pair of doubles and four RBIs in six starts for the A's. Luckily Canada A’s first baseman Beau Brett is a good sport, so he just smirks and laughs it off. “Honestly, I get it all the time,” said Brett, the nephew of the Kansas City Royals legend. But being part of a baseball bloodline has its advantages, despite its frequent provocations. Besides his famous uncle George, another of Beau’s uncles, Ken, was a journeyman in the major leagues playing for 10 different teams in his 14-year career. John, another uncle, spent time in the minor leagues with the Boston Red Sox. His father, Bobby Brett, played college baseball at Cal Poly Pomona and spent time in the minor leagues as a part of the Royals organization and now owns a handful of minor league teams including the Spokane Chiefs. It was in Spokane that Beau began laying his foundation to be a second generation major leaguer. Beau prepped at Ferris High School where he was a three year Greater Spokane League all-league selection. He also garnered two All-State selections making the first team as a junior (second team as a senior). He was the eighth ranked prospect in the state of Washington in 2008 (no. 175 in the nation) by Baseball America and baseballnorthwest.com. Brett spent two seasons at USC working with Chad Kreuter, a 15-year MLB veteran. Despite limited playing time in his two years with the Trojans, training with one of the elite college baseball programs in the nation helped Brett make the necessary strides in his game to be ready to compete at the next level. In the 2010 MLB Draft, the Los Angeles Dodgers agreed that Brett was ready for the next level when they drafted him in the 35th round. Brett joined the Dodgers’ rookie league team in Arizona after signing with the organization in June and was glad to get his feet wet in rookie ball. He had 22 hits including three doubles and a triple while boasting a fielding percentage over 98 percent in 26 games. A year later, Brett is ready to make the jump into minor league ball. And though he is not yet 22, he could be well on his way to making it to the big show.